Everyone needs clean clothes – especially in a hot and humid climate. 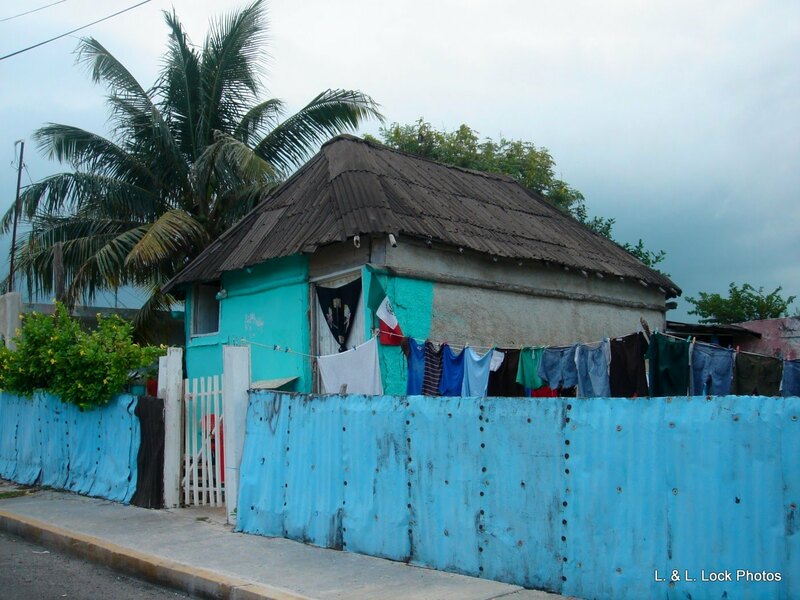 Driving around the island on a sunny day you may notice many houses have a clothesline strung across the front, festooned with brightly coloured clothing snapping in the Caribbean breeze. There is nothing like the fresh, clean smell of sunshine-dried clothing! But sometimes doing your own laundry isn’t an option. 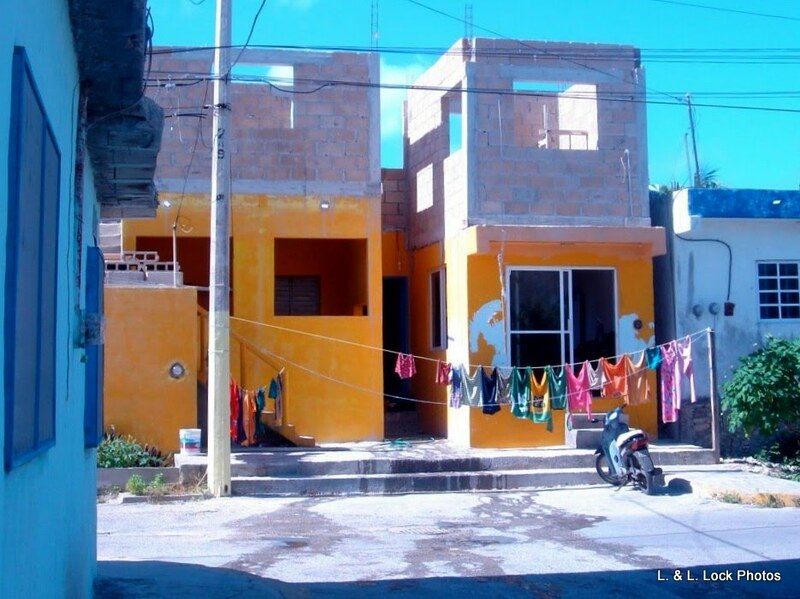 On Isla Mujeres the average house tends to be quite small, about the size of a one-bedroom apartment with no room inside for a washing machine. The machines are costly, and the repairs can be never-ending with the high humidity and salt content of the ocean air. Even if an islander has the space for a washing machine buying one on credit is not a good option. In Mexico interest rates for credit cards are prohibitive, ranging three to four times higher than the USA or Canada. Forbes Magazine listed a sample of the rates in an article published April 2012: American Express 42%, HSBC 48%, BanCoppel 88% and the Azteca Bank/Electra Centers higher still, but unwilling to disclose their actual rates. Electra is one of the many companies in Mexico that specialize in selling appliances – as small as a toaster and as large as a refrigerator, or motorbike – with extremely low monthly payments that bring the final purchase price to three or four times the original cost. So what do people do? Improvise! In Canada, and many other countries the solution is commercial businesses offering coin-operated laundries or laundro-mats as we call them. They are generally located in every city or town near where apartment dwellers have easy access to the facility. A number of the coin-operated businesses offer assistance, for a fee, allowing the customer to leave their washing with the attendant, retrieving it after work or after shopping. 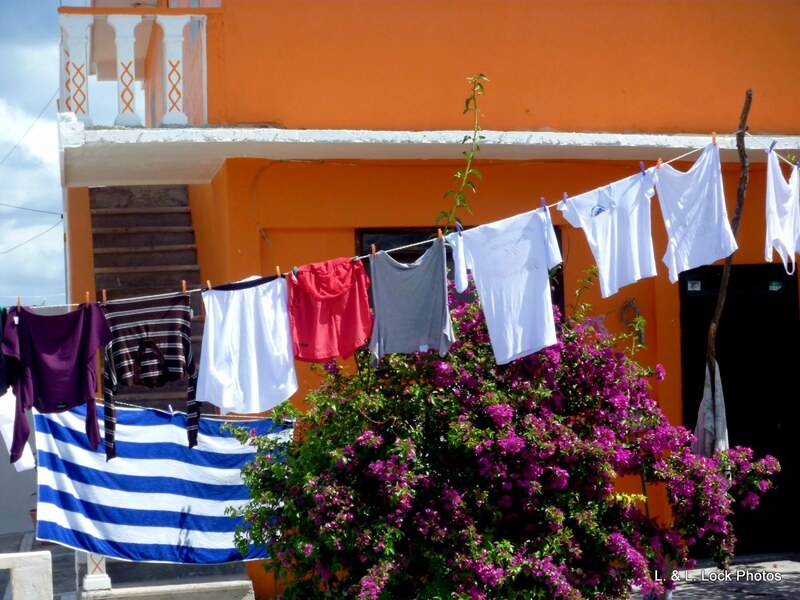 When we first moved to Isla, a few years ago, I was entranced by the idea of line-drying our sheets and towels. I asked Patricio to install a roof-top line for me. Then for the next six months I trundled up to the roof, carting my freshly washed linens, carefully pinning them to the line. Ah, fresh clean sheets! An hour later I would return to remove the fresh, clean sheets ….to find them wrapped like large white sausages around the line, over and over and over again. Still wet. The Caribbean breezes had been playing games. Eventually after fighting the wind and rusty clothes pegs that left non-removal marks on everything white or light coloured – I gave up. I now use our propane-fired dryer. I don’t mind doing the laundry. I can do it when I please, stuffing a load into the washer while I wander around in the morning with my first cup of coffee. The folks who do use a clothesline learn to keep an experienced eye on the weather. A sudden squall off of the ocean can ruin a day’s work in a few minutes – soaking the clothes, delaying the drying time, or shutting down the operation for the entire day if the rain settles in for a few hours. Hopefully the colourful clotheslines won’t disappear entirely. They are so much a part of Isla’s character. When we moved to Ontario we noticed lots of people still use the wash lines where in B.C. it is frowned upon. I noticed the laundry flapping in the breeze on Isla and especially ones that where hanging right on the street.I myself like the convenience of my washer and dryer. Hi Becky: I actually had your name in brackets after the “photo-nut” comment of the blog, then removed it as I realized I have a FEW other friends who take lots of laundry-line photos as well. Your combination washer-dryer sounds like the European ones; swish swish – pause. Swish-swish – pause. It takes forever! Becky: forgot to ask ….. what the heck is Tim Pho? We say T.I.M. as in This is Mexico, but don't know what you mean. Tim Pho is the laundry service/shop downtown on Juarez, across from Poc Chuc. 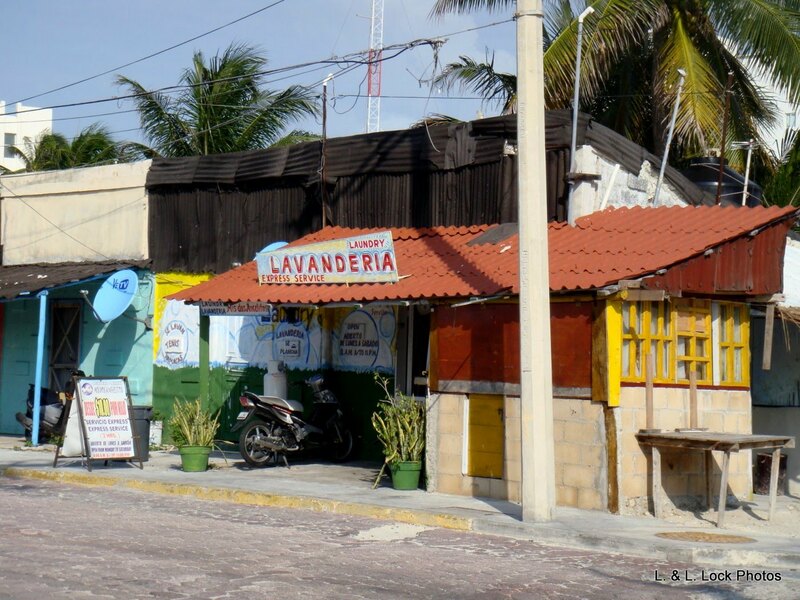 There are long laundry sinks by some houses, often used daily by the abuelita of the casa. Less expensive lil machines that only agitate are popular, and allow women to get through a mountain of laundry in a morning…with a lot of wringing & filling/draining of laundry. But in comparison, my housekeeper isn't a fan of my American washer that takes longer (but is effortless). Hi Ronda: Thanks, I have passed that place hundreds of times …. never noticed the name of it. I remember when my mom had a wringer washing machine, and the hard work that was necessary to do laundry with that beast! I got pretty good working it when I was just a little kid. The wringer part was always a bit scary though. And then … dad bought her a Bendix combination washer and dryer. Woo Hoo. That was easy, but slow, very slow. Swish swish pause . . . then it sounds like a jet taking off when it goes into the spin cycle. Then squirts more water on the clothes in the dry cycle? I also use Tim Pho as a drop off spot when I take taxis to town. 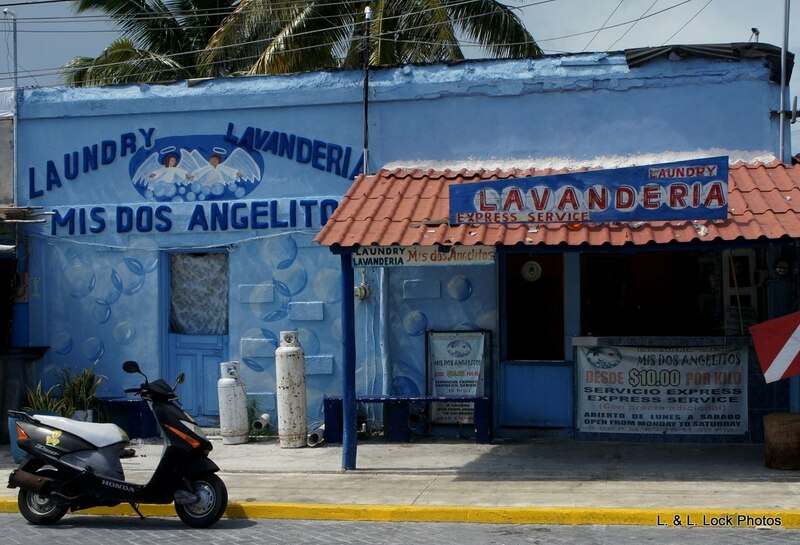 I always thought there was some Asian guy on Isla with a laundry, but a cab driver told me one time that the name is related to the Mayan word for lavanderia. Don't know if I understood him correctly. Next PostNext It’s mine! It’s mine. It’s all mine!